There was a time when it would have been difficult to imagine Lance Armstrong being happy to end the Tour on the third step of the podium. But there he was, happy to be there next to his Astana teammate Alberto Contador. During his seven year reign at the top of the sport, no one thought that Lance was just happy to be there; he rode with the killer instinct rare even among the planet's most supremely determined athletes. This year, he said finishing third was "not bad for an old fart," and acknowledged that Contador and second place finisher Andy Schleck, both more than a decade younger, were the stronger riders. To have Lance Armstrong competing for the yellow jersey—at one point he was only 22/100 seconds off the lead—grabbed headlines around the world. A friend compared it to the Tiger Woods effect; when Tiger is in the hunt in a major tournament, ratings soar. The rivalry between Armstrong and Contador made for some terrific drama. Two former Tour winners, riding on the same team by happenstance, forced to work together for the team and their own self interest, except for those thrilling moments when Armstrong gained a few seconds through alert riding, or Contador proved to be the best by riding away from his rivals on a mountain stage. At first I was among those who wondered why Lance Armstrong should mount a comeback when he already had a perfect record of seven wins in seven consecutive Tours. Was he risking his place in history, like those boxers who keep fighting well past their prime? I can think of five reasons why his return was a triumph: First, the stated reason of generating interest in the Livestrong Foundation: media attention spiked during the Tour. Second, he thought he could compete at the top of the sport, and was proven right. Third, he enjoys riding a bike. You have to enjoy riding to spend five hours a day riding over mountains. Fourth, he gave back to the sport he loves. Interest in the Tour was higher than ever, even than during his glory years. More than half a million spectators lined the road to Mt. 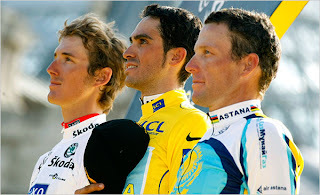 Ventou to see Armstrong and Contador play cat and mouse with the Schleck brothers. Fifth, he seems more human, and no longer so cold. As the New York Times reports, Armstrong "appeared to win the hearts of the people of France, the country that once loved to hate him." For me the end of the Tour is like the end of summer vacation (even though I watched from my living room). Now we have 49 weeks until the world’s greatest sporting event again winds its way around France. Funny, my daughters name is tommi ronk. Funny how Lance can redeem himself by coming in third. Only in France. My hats are off to all the riders in this years Tour De France.